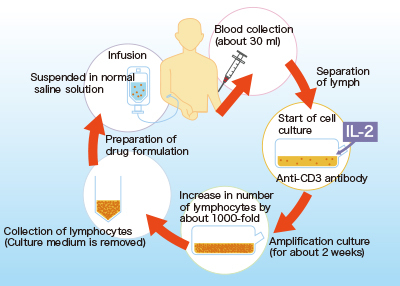 Activated autologous lymphocyte therapy｜cell culture company｜Lymphotec Inc.
What is activated autologous lymphocyte therapy? Activated autologous lymphocyte therapy was developed by Dr. Teruaki Sekine, Chairman of the Board of Directors of our company. This is immune cell therapy that enhances the ability to fight cancer by recovering a weakened immune system. Lymphocytes, which are immune cells that inhibit the growth of cancer cells, are collected from the patient’s blood (about 30 ml). The lymphocytes are activated, growing in number by about 1000-fold, and then returned to the body of the same patient. Effects of this activated autologous lymphocyte therapy include prevention of the recurrence and progression of cancer, and improvement of QOL. The treatment has very few side effects because the lymphocytes used for the therapy are derived from the patient, and can be applied to almost all cancers. The origin of activated autologous lymphocyte therapy was LAK therapy developed by Dr. Steven Rosenberg of the National Cancer Institute (NCI) in the United States in the early 1980s. In LAK therapy, NK cells activated with IL-2 (cell-activation factor) are administered via infusion. However, there is a limit to the proliferation of NK cells, and the number of cells does not increase much. In addition, there are severe side effects caused by the necessary large dosage of IL-2 and the efficacy is limited. Accordingly, LAK therapy is scarcely used today. 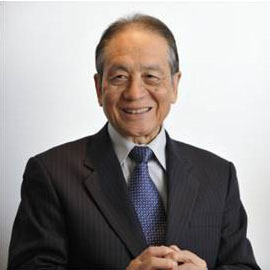 Dr. Teruaki Sekine, Chairman of the Board of Directors of our company, developed the activated autologous lymphocyte therapy, based on LAK therapy, when he worked at the National Cancer Center in the late 1980s. Activated autologous lymphocyte therapy allows T-cells to proliferate in number by about 1000-fold by activating the cells with anti-CD3 antibody and IL-2. In addition, the therapy successfully eliminated the severe side effects by removing the anti-CD3 antibody and IL-2 from the formulation before administration. After further technical improvement, the therapy was established as the first immune cell therapy. Its efficacy was proven through clinical trials aiming at preventing recurrence after liver cancer surgery. A clinical trial was implemented aiming at preventing recurrence after surgery for liver cancer to validate the effect of activated autologous lymphocyte therapy. It is known that liver cancer recurs within 3 years at a rate of 70% even after all visible cancer lesions are surgically removed. The clinical trial was conducted as a randomized controlled study, which provides the most reliable evidence. The results were published in the British medical journal The Lancet, and the proven therapy is recognized by the global medical community. Randomized controlled studyOne hundred and fifty patients with liver cancer who had successfully undergone surgery to remove cancer tissue were randomly divided into two groups: 76 patients who received activated autologous lymphocyte therapy and 74 patients who received no therapy, and then the course of the disease was observed. In the results recorded at 4.4 years after the start of observation, the recurrence rate for the group that received activated autologous lymphocyte therapy was 59%, while that for the group that received no therapy was 77%. Converted to recurrence-free survival rate, these figures are 41% and 23%, respectively. Thus, the results show that the therapy increased the recurrence-free survival rate by 18 points, from 23% to 41%. 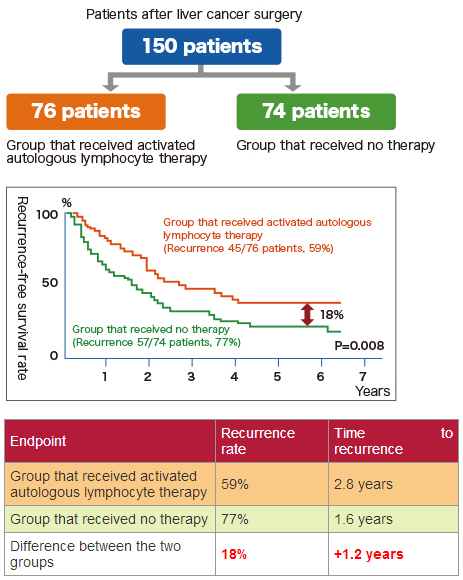 Furthermore, the average time to recurrence for the group that received activated autologous lymphocyte therapy and the group that received no therapy was 2.8 and 1.6 years, respectively. This means that the therapy statistically delayed recurrence by 1.2 years. There are currently a variety of immune cell therapies, and a number of case reports have been presented at academic meetings; however, the only therapy with proven effects through highly reliable evidence is the activated autologous lymphocyte therapy published in The Lancet. April 2014 Appointed as Chairman of the Board of Directors of LYMPHOTEC Inc.